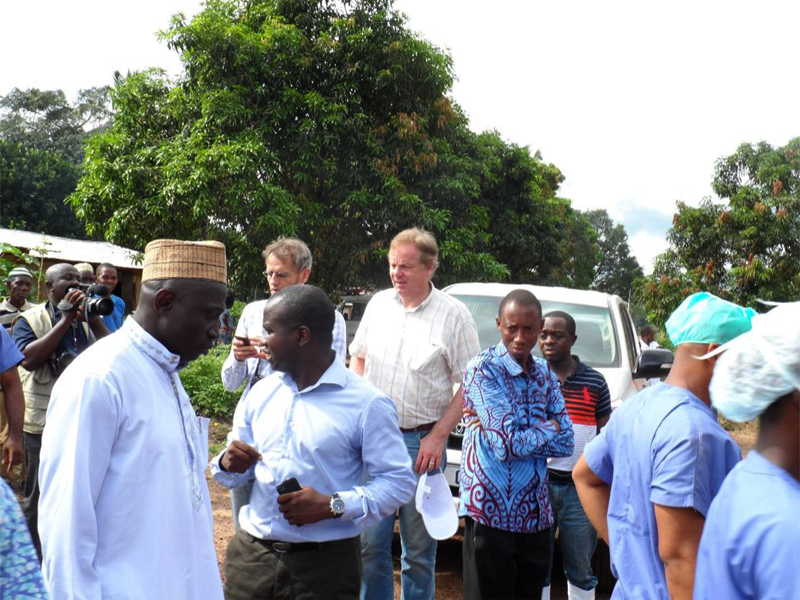 It was on Monday, 4th November, at about 2pm when the Cordaid Netherland team arrived at the St. John of God Catholic Hospital compound, the safest and Ebola free compound within the Chiefdom. Picture below indicate the encounter with the press team at the entrance of the hospital. Upon their arrival, little time was wasted when I engaged the Press team and they started asking me on issues of their interest. One major issue was when did the hospital cease operations and why did we cease rendering public service. In trying to give them a satisfactory response, a lot of attention was focused on the loss of Br.(Dr.) Manuel Garcia Viejo, whom I think and was convinced that the Dutch people would have heard a lot about and would like to get a feel of the story from our side. Indeed, I briefly narrated the story. 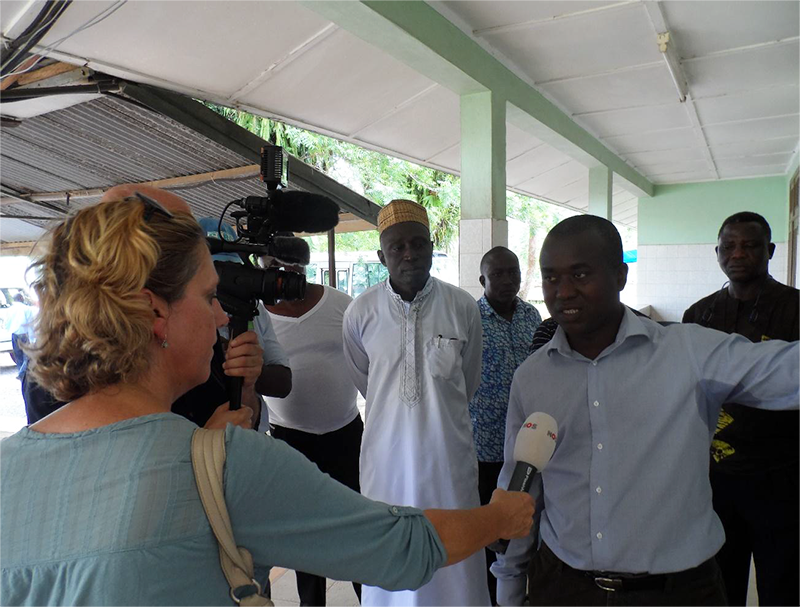 This story included the support of training received by CORDAID Netherlands from September 2-6, 2014, before the Hospital re-opened and just after the death of the medcial doctor, it was closed down again. Br. Michael pointing at a photo of late Dr. Manuel posted on the wall at the entrance of the Out Patient Department of the hospital. Meanwhile, an interview was conducted with Madam Isha Daramy Kabia, the veteran nurse from the United Kingdom supervising our outreach activities and consultant trainer. See photo below. I then asked the team to interview some staff with regards to the activities which we are carrying out presently in the quarantine families. 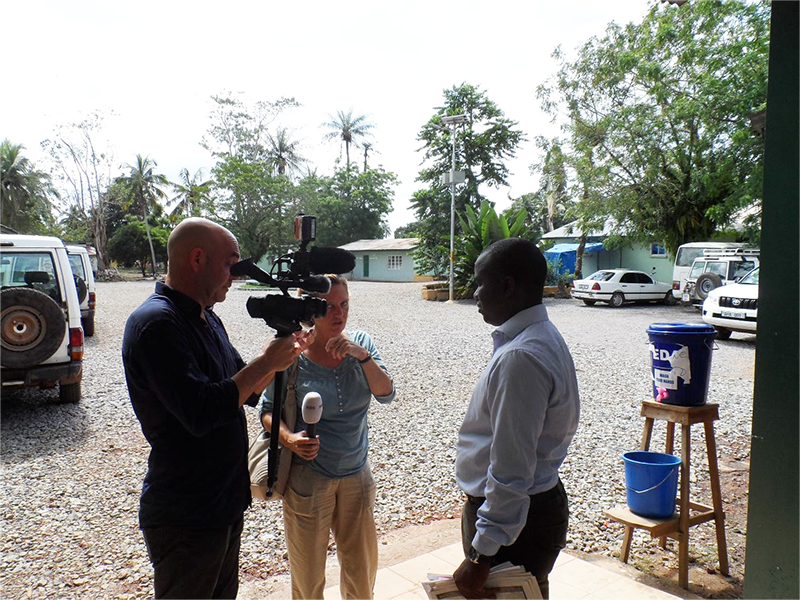 Later on, the press team was interested to see the Ebola Holding centre, which WHO now call “Community Care Centre”. In the centre I briefly explained the various points and their functions within the structure. Where we are standing is the Green zone of the centre, simply telling us that only staff with no contact can enter there without Personal protective Equipment. Another very important scene of the visit by the team is a site visit to the quarantine homes. 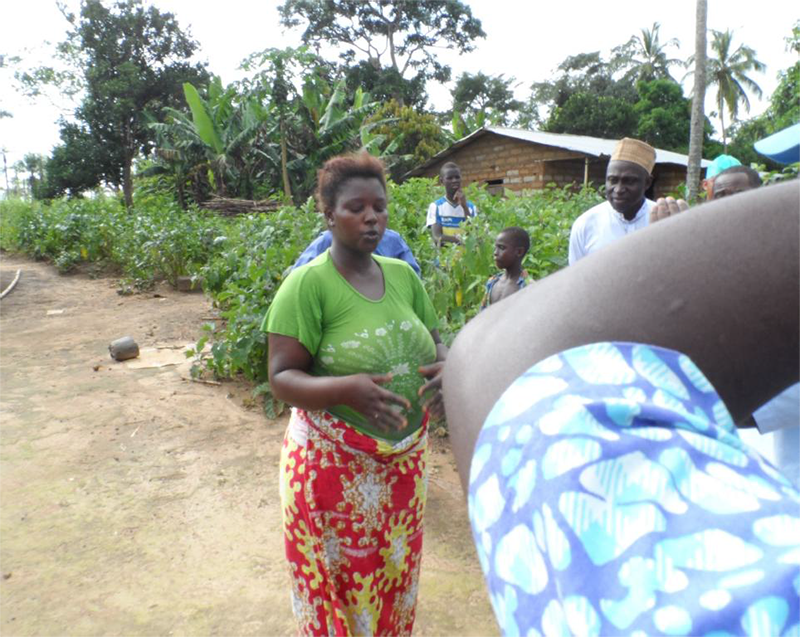 The supervisor of the outreach instructed that we visit only one family that has ben quarantined in Kontha Bana village. 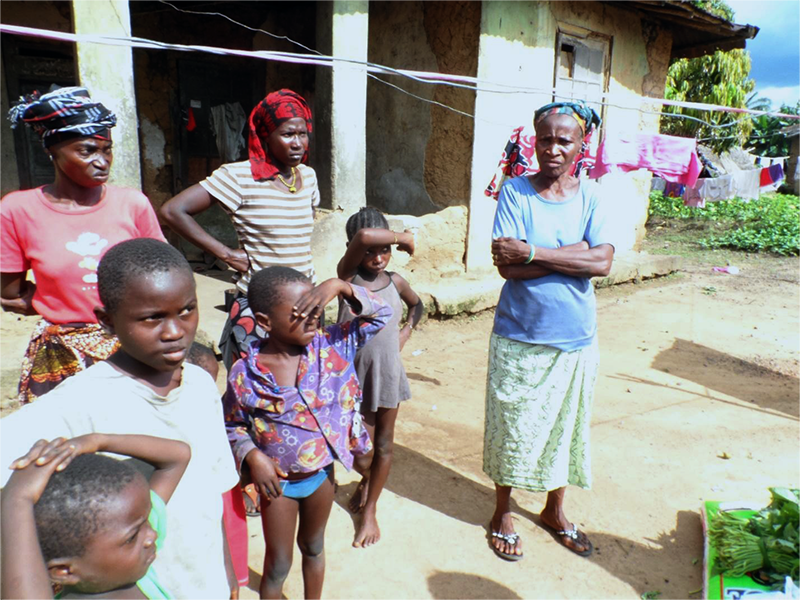 In this family, the head was infected with Ebola virus and died, which led to the whole family being quarantined. It has been very usual for the hospital staff to visit this family every day during which food items and drink are provided to them, thanks to fund provided by Mesean Cara from Ireland and the Dutch. The family below has been quarantined since the 19th of October when the father of the family got himself infected and later died. What is amazing in this kind of situation now, is that most times the persons die before a confirmed diagnosis is made. Also, most families are afraid to declare their relatives sick until when they are critically ill and when a sudden death occurs before we can become aware. But this behavior is changing now because of the intervention of the hospital in some of these local communities as they begin to have confidence in our staff and as such they report earlier any sick persons. This family was visited on the 4th November, during which we assessed their temperature, counsel them. As you can see, the father of the family is dead, left only with the mother and children and grand children. It is sad. Who will provide for them. That makes the difference when the St. John of God Brothers with the support of the Dutch people as well as the Irish people provide the means for the survival of such a family. There are many of these in the chiefdo and in the country. Madam Isha Daramy Kabia, the veteran nurse taking the temperature of a child. Madam Isha Daramy Kabia holding a 5 litres of palm oil to be given to the family. This will serve them a week and it cost about 5U$ dollars. Some members of the CORDAID TEAM, Hans and others observing the intervention closely. The Local tribal head of the Lunsar Town, Chief Alfred Kamara contemplating on the seriousness of the situation. The father is dead, the breadwinner of the family. Food is being provided for this family for the week. Mariatu Deen Koroma narrating her story. The lady above is a survivor from Ebola, called Mariatu Deen Koroma. 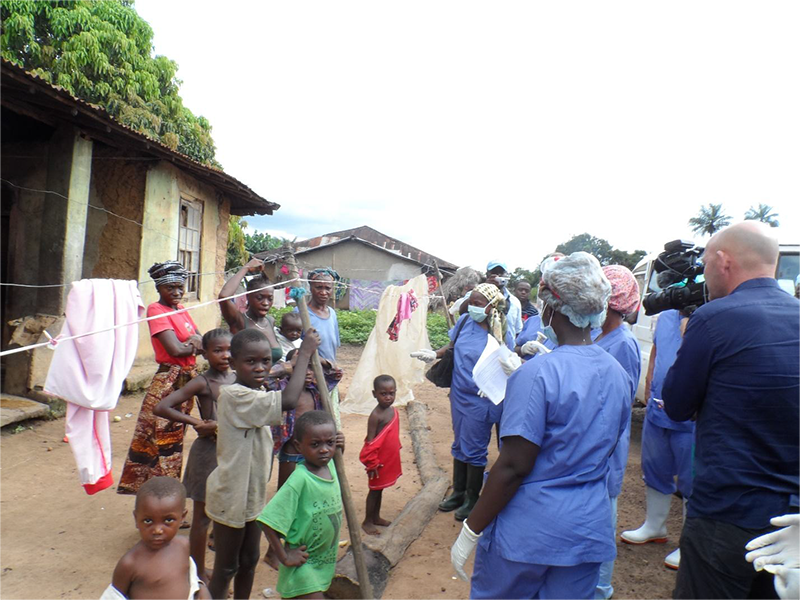 She was caring for her mother whom she did not know ealier that she had contracted Ebola and later died. She, according to her story was quick enough to accept the early symptoms manifested by her to report herself and that led to her recovery. She is from this same village community Kontha Bana. 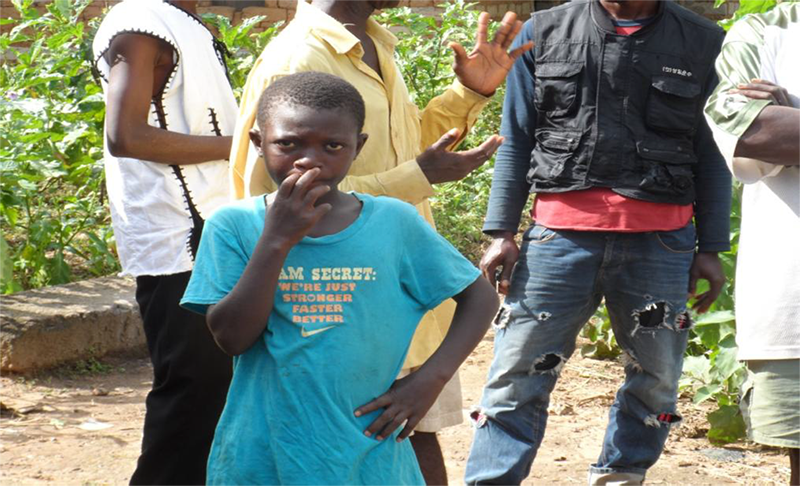 The boy below is also another Ebola survivor from the same village kontha Bana, called Eddie Kelloy. What is worrisome now for the people is where to go when they report sick. There is no health facility closer by to wait, so they are forced to stay in their homes which expose them highly. What one is thinking about, why not friends can consider the construction of temporal huts in each village in the chiefdom to serve as a waiting area and train Community based health persons with basic skills to take responsibility of sick persons in the village and provide basic advices and care whilst waiting for the response from us. 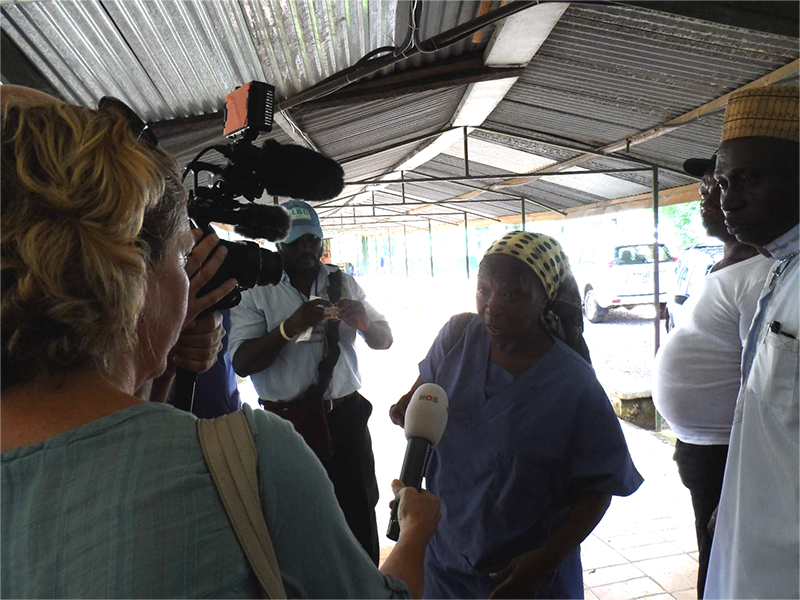 The Press Team for CORDAID NETHERLANDS, interviewing one of the Ebola Survivors. 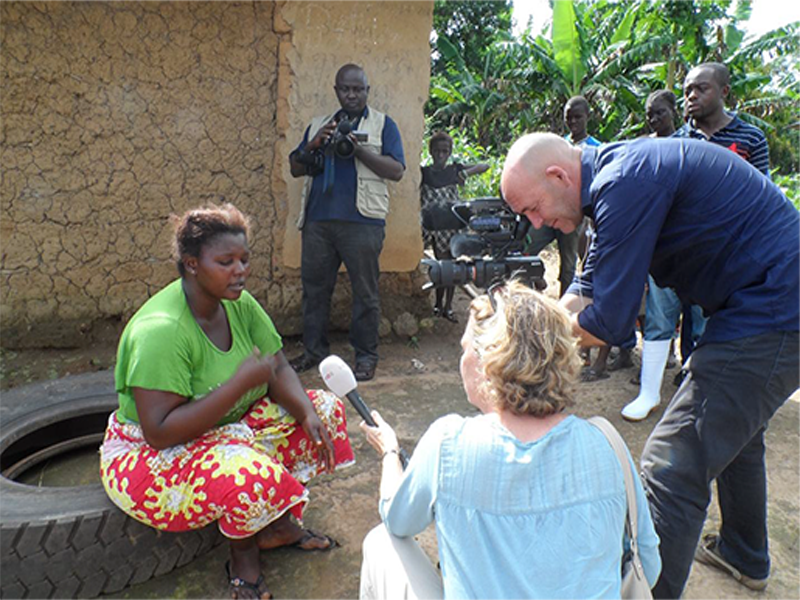 In Marampa chiefdom, we have a record of 45 Ebola survivors. From September 17 – November 1st, 2014, 289 persons have died in the chiefdom which comprises 146 villages, in Port Loko district. Out of this figure, 48 are Adult Male, 84 Adult Female, 26 Adolescents and below 5 females, 50 adolescent and below 5 males. The little boy above in the photo is among the number and is one of the survivors. Today many of them are orphans, traumatized and left with nothing. What can we do for them? El Dr. Eduardo Celades, que nos ayudó en el traslado del Hno. Manuel Garcia Viejo a España, nos resalta en este artículo la falta de medios para combatir el Ébola: falta de médicos y de infraestructuras adecuadas con capacidad de acoger nuevos casos, teniendo en cuenta que cada semana se incrementa el número de afectados. Remarca, también, que la mayor parte de los contagios se produce en los ritos funerarios y en el enterramiento de los fallecidos, así como el alto riesgo que representa para los profesionales de la salud. 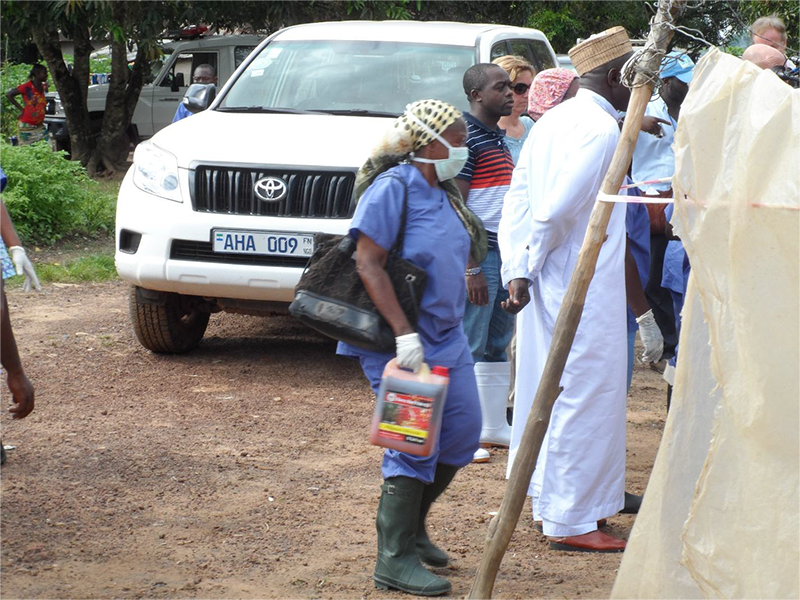 Esta entrada fue publicada en ¿Quién va?, Hospital SJG Mabesseneh, Notícias / Actualidad, Sierra Leone y etiquetada ébola, epidemia, EVD, noticias, Saint John of God Catholic Hospital Mabesseneh, Sierra Leone por comunicaciohsjdbcn. Guarda enlace permanente.